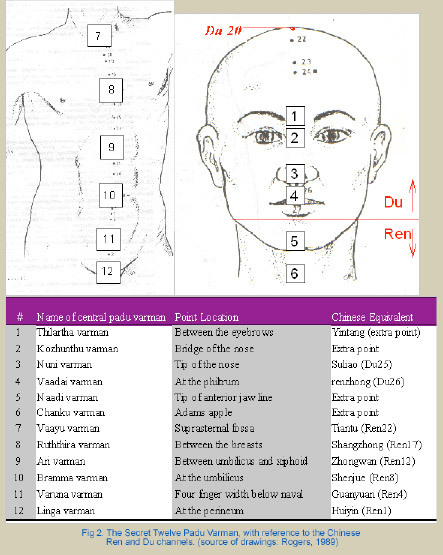 Interviews with varman practitioners in districts of Kerala, South India, revealed other sources of information for varman-adi (action of varman) that presented different locations for the twelve Padu varman on the human body. According to Balachandran Nair, a Kalaripayattu practitioner in Trivendrum, much of the deeper knowledge of varman has gone “underground”. Issues to do with correct point location and techniques for opening and closing the varman were not openly taught for many reasons. “Modern ideas concerning varman lack the keys for the understanding of their use and their connection to the primal force that maintains life” (Nair, private communication 17/10/98). In what is believed to be the first English translation of a part of an ancient, privately held text, belonging to a practitioner in Kerala, a different padu varman model has emerged. The part translation of the unpublished Dravidian (Siddha) text, originally recorded on bamboo, was provided by a Dravidian practitioner. 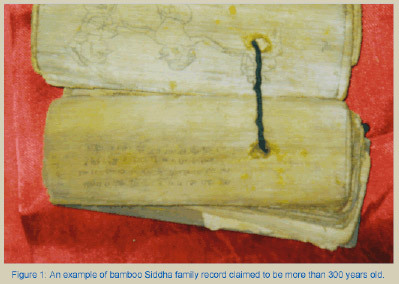 This text, and other bamboo records, were claimed to be over 300 years old (see Figure 1) and provided the location of secret padu (see Figure 2), which differ from the standard locations represented in previous tables (see previous article Dravidian Varman Model #1). This is strong evidence in support of the theory that there are secret varman records in southern India which are not openly taught or revealed. Master Nair confirmed the above information as correct and provided illustrations of his own family traditional teachings of varman that appears to incorporate varman from models represented in previous tables ie. padu and thodu varman (see Fig 3 & 4). Dravidian Varman-adi practitioners claim that knowledge of varman is contained in scripture which has been kept intact and secret for thousands of years. These texts support the Dravidian family heritage of martial and therapeutic varman use. The key features of yoga theory and Varman-adi practice lie in the internal connections between varman, underpinning the types of varman and nadi (channels) used in the internal practices of these traditional philosophies. 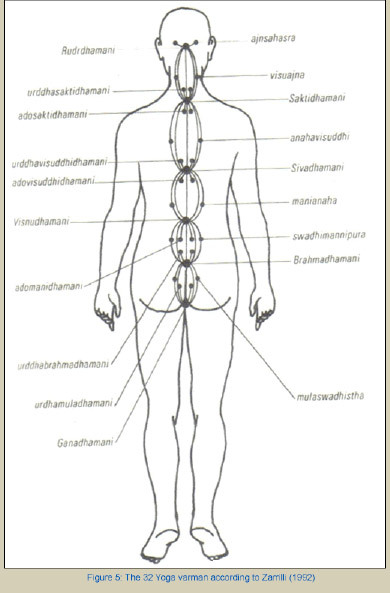 The kundalini, the primal channel which is composed of three pathways, the Ida, Pingala and Sushumna, forms the basis of all channels and varman in the body. According to Dravidian practitioners, the kundalini is the activating principle of life and ascends to the top of the head from its root at the perineum. Chinese medicine recognises three primal channels as Chong mai, Ren mai and Du mai. According to Chinese theory, these three channels are believed to be the first to activate and bring about life in the womb. Originating in the kidneys and then passing to the perineum, their influence ascends to the top of the head along the spine (Matsumoto and Birch, 1986). According to the marman research by Zarrilli (1992), it is believed that there are physical and subtle marman which “exist in a complimentary and symbiotic relationship”. Zarrilli has cited a set of 32 “yoga” varman which, according to his published interviews with Nair, constitute “the conceptual and practical link between the gross and subtle paradigms of the body” (Zarrilli, 1992, p10). The 32 “yoga” varman listed by Zarrilli in his research are not referenced, but the varman names appear to originate from Sanskrit sources rather than Tamil or Keralan languages, as used by traditional Dravidian or kalaripayattu practitioners. 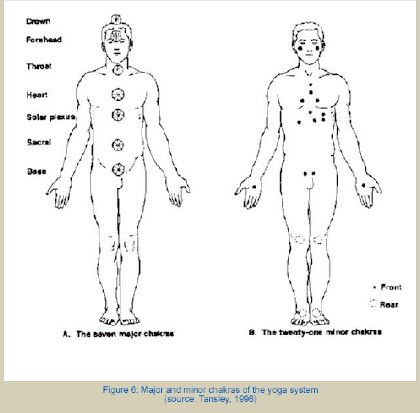 This suggests that the 32 “yoga” varman have a probable link to the Vedic yoga system (see Figure 5). An additional view of the yoga chakras (see Figure 6) places an emphasis on major and minor varman. It is reported by Tansley (1998) that the major chakras are formed by the intersection of twenty one energy “strands” at the site of the chakra. He further states that the minor chakras are formed by the intersection of forteen energy “strands” and that the marman are locations where seven energy “strands” intersect. 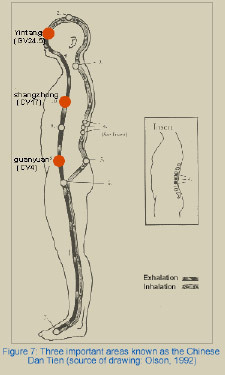 The minor chakras illustrated in Figure 6 appear to be disassociated from the major chakras which have a strong resemblance to the Chinese Daoist tien (energy collection) centres, as used in Tai ji Chuan exercises (see Figure 7). In addition to the 108 varman, Pillai, a Siddha practitioner, claimed that a further 720 varman points are recorded in Dravidian texts and make up a vast network of nadis (Pillai, private communication, 26/11/99).